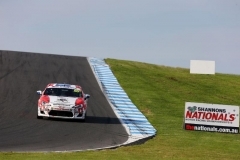 The stunning Victorian complex of Phillip Island Grand Prix Circuit was the site of Pedders Racing’s Round 2 challenge – the Great Southern 4 Hour. It wouldn’t be the biggest of fields for the Australian Manufacturers Championship, but the series and the southern circuit remained true to their promises of action packed, heartbreaks and highlights of racing, seeing the refreshed #86 bring home some Island magic with multiple victories signaled by the flag. 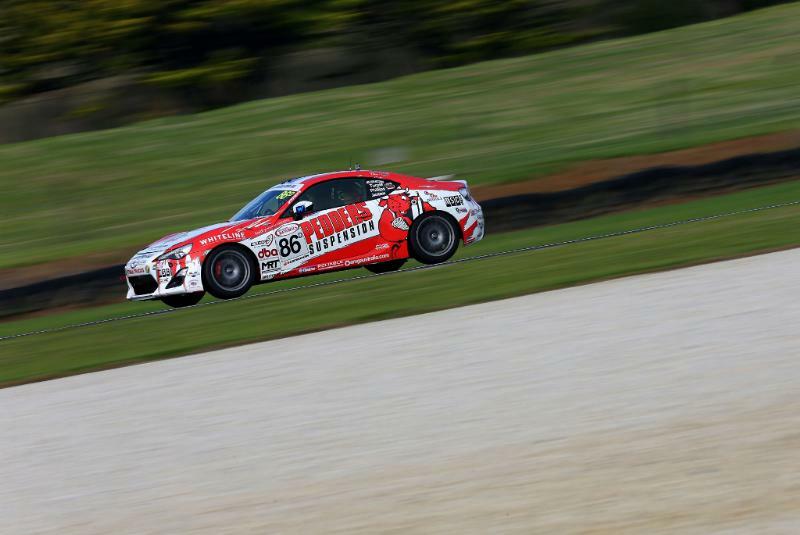 On a positive Practice day, the 86 was showing grace and performance, Phillips and Turpie saying that the 2013 Class Champion was feeling the best of its racing life after recent setup changes and performance improvements. Posting times up to five seconds faster than Class D’s from the previous Island outing, lapping faster than some higher classed cars, the 86 was closing in on the Class C entries’ performance causing chatter along pit lane. Qualifying introduced some speed bumps with Turpie taking on the opening qualifier to set a 1:52.78, almost ten seconds faster than 2014’s Class D pole time in the better weather and clear air, while for Phillips, the vastly improved performance and greater exit speed out of the final turn had the 86 pushing hard, the engine feeling the pinch and temporarily cutting out at 214km/h. 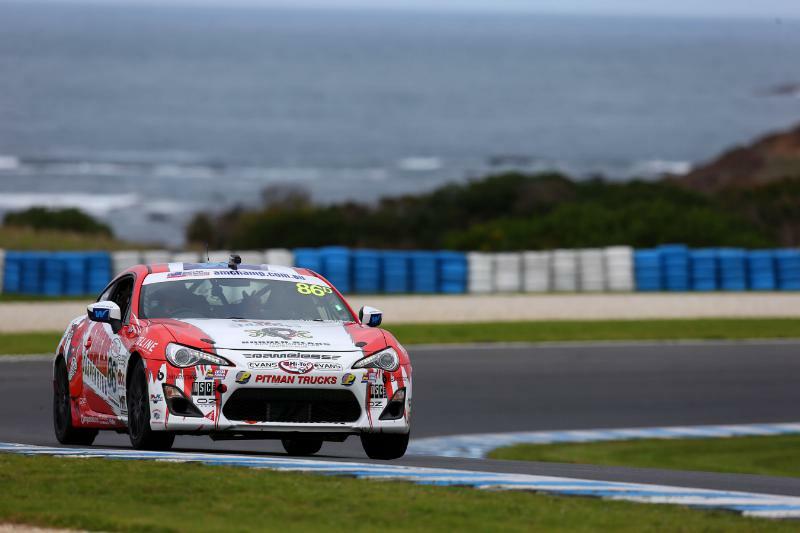 Race day Sunday and the late morning start saw Turpie take the #86 to the track for just minutes in the Warm Up session, the ECU having gone into limp mode restricting speed and revs. Pulling into the garage without setting a lap, the combined Pedders and Motorsports Training Australia crew completed investigations, discovering an ABS sensor failure in the right rear wheel, stemming from an issue after replacing the CV shafts the previous evening. Lining up on the grid next to a BMW, with a duo of Falcons in the sights ahead. While there was no direct class competition for the #86, Phillips was on a mission to prove the 86 could perform in battles with the higher classes. Lap one didn’t go to plan, a spin at MG Corner seeing a near miss from the trailing BMW, but Phillips was soon back on the power hunting down the field with four hours of racing ahead. 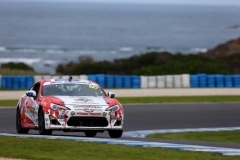 Within two laps, eight kilometres of racing, the 86 was back in the action, by lap four having passed a pair of BMWs to push towards the front. Holding steady on the verge of the top ten for the next 20 laps, Phillips controlled his performance to avoid the hiccup of the electronic gremlin before the Class C Renault of Jouy exited pit lane ahead of the 86, Phillips closing onto the bumper to battle the higher classed rival until the first round of pit stops began. When coming in for driver change and refuel, the 86 had been as well-placed as fifth outright, entering pit lane on lap 51. A smooth stop and Turpie had the wheel, returning to clear track to hold place in the lower half of the leading ten, a relatively easy drive having avoided a cold-tyres entry ahead and driving away from the accident of the day as preparations of a MacKelden BMW underpass at turn ?? turned to shock as the Safety Car was called, the potential challenger having had a big impact with the tyre wall. With the field controlled, the pit lane became the place to be, a mass of vehicles and personnel as teams scurried to complete pit stops under yellow. As the 86 entered the lane, a neighbouring team pulled their vehicle half into the Pedders Racing pit bay, and with the other neighbours already completing their pit stop, Turpie had nowhere no to and nosed in leaving the team unable to refuel. With driver change complete, Phillips was pushed through a three point turn to get the dry brake close enough for refuel as vehicles exited the lane around the 86’s crew. Back on track from lap 89, the next 15 passes of the Island circuit continued behind the Safety Car as the crashed BMW was retrieved and the tyre wall patched for safety. 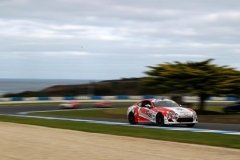 Action aplenty, the final eight laps of the Great Southern 4 Hour saw another class versus class battle, the 86 showing improved performance and taking on the Class C Falcon of Russell, reeling in the turbo six through the corners as the Falcon pulled away on the straights. Phillips had many chances to make the pass, but knowing the end was near and the risk versus result simply wasn’t worth the potential damage and heartache, Phillips kept the battle underway to the flag, crossing the line to take a second Class D victory of the season and achieving the team’s best outright result to date with sixth place. 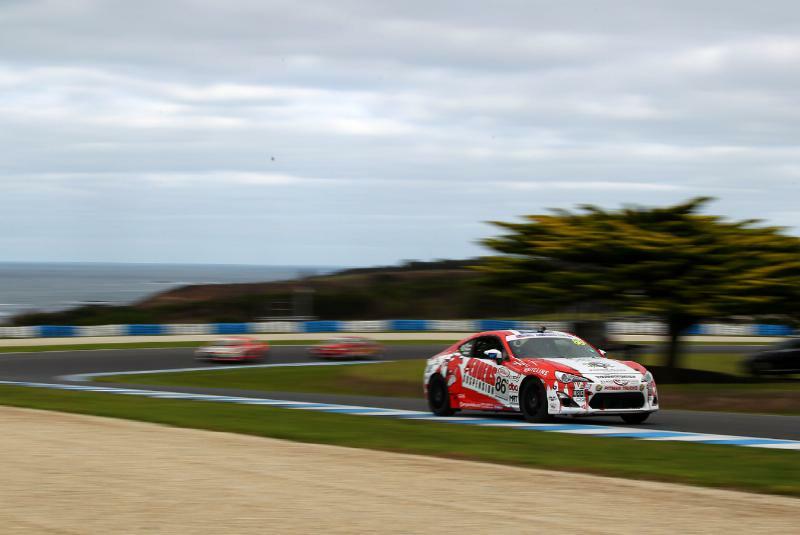 Once the ecstatic crew had cheered the 86 and its challengers home, a debrief celebrated all the team continues to achieve and opened the door to the next list of developments to come into play. “This car and this team just keep on getting better. 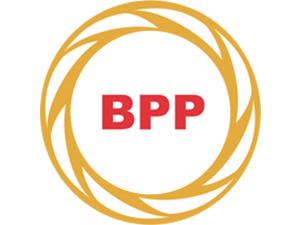 The more we push, the more we perform and it’s great to have the results for the team and sponsors, the confidence to take on the next list of developments, and to know that the higher classed teams are paying more attention to us than ever before. “It’s now our third season with this car, and she’s given us a lot of challenges and a lot of memories, this weekend being another one to add. “We’re pretty proud that we have the people to keep us improving, and we just keep on getting better and can take on the other classes in genuine racing battles which makes it all so much harder but so much more rewarding. 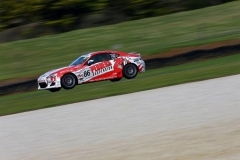 Pedders Racing will return to the track for Round 3 of the Australian Manufacturers Championship at Queensland Raceway, 7-9 August, when the series takes on the annual Fight in the Night as part of a dual 200km race weekend. 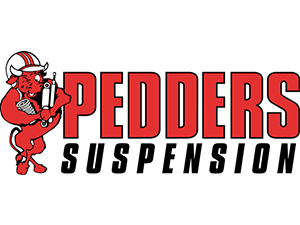 Pedders Racing is proudly supported by Pedders Suspension, Borneo Bears Australian Rules Football Club, Weldcorp, Motorsports Training Australia, AMG Australia/Oz Racing Wheels, Pitman Trucks/Euro Truck Spares, Whiteline, Reliable Rack & Pinion, Total Tools Dandenong, CV Plastics, DBA (Disc Brakes Australia), ssMEDIA, Moro & Dooly Accident Repair Centre, Bears AFL AusKick, MSC Signs, MRT Performance, ECUTek, Evans Waterless Coolants, Heidi Yi Mineral Cosmetics, Valvoline, Exedy, Nameless Performance, Mishimoto Automotive, Simulated Diamonds, Bartercard Central Victoria, Charge Speed, Project Mu, Fluidrive Bendigo, Pedders Bendigo, J&A Logistics and CIMA Media.